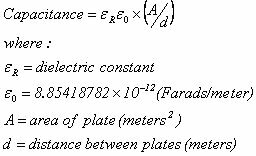 Calculating charge storage capacitance (separate page, new for March 2007! Use our reactance calculator if you are interested in this topic! Capacitive reactance is the "imaginary" impedance of a capacitor expressed in ohms. Note the negative sign, which implies that on a Smith Chart, adding series capacitance tends to rotate your reflection coefficient counterclockwise. It's a function of frequency. The dissipation of the same 1 pF cap at 10 GHz would be 0.6%. The well-known formula for parallel-plate capacitors of "infinite size" is given below. Most parallel plate capacitors behave close to ideally because there area dimensions (length and width) are much bigger than their plate separation. No consideration of the fringing fields is usually necessary unless you are working with extremely small capacitors (perhaps less than 1 picofarad). If you construct a capacitor of 100 x 100 microns (0.1 x 0.1 mm), it will have a value of 3.3 pF. The first resonance of a capacitor is the series resonant frequency. 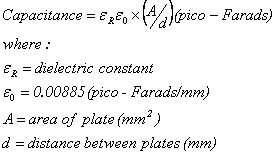 Referring to the model below, this is the frequency where the capacitive reactance and inductive reactance due to LS cancel. 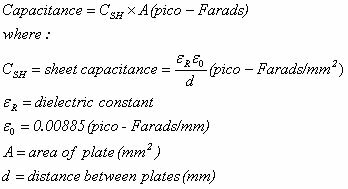 The frequency at which the series inductance of a capacitor is equal but opposite to its capacitance. Click here for an explanation of series resonance on our filter page. This is where the capacitor behaves as low-value resistor (equal to the ESR value). This typically occurs at twice the SRF frequency. Click here for an explanation of parallel resonance on our filter page. Usually you have no business operating a capacitor at or near the PRF, because it acts like an open circuit in this case!